038 MENS EX-COND INDUSTRIE RELAXED FIT ARCTIC CAMO CARGO SHORTS SZE 32 $100 RRP. Men's RVCA Reynolds USA Navy Long Sleeved Tee, Size L. NWT, RRP $79.99. 088 MENS NWOT NIKE S/POCKETS RELAXED FIT NAVY CARGO SHORTS SZE MEDM $90 RRP. 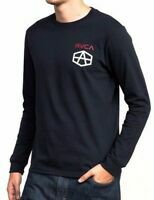 Men's RVCA Camp Harmony Black LS T Shirt / Tee - Size M. NWOT, RRP $59.99. Men's RVCA Feelin' White Surf Shirt / Tee. Size L. NWT, RRP $49.99.